Vibe on the street: alternative, lively, colourful and studenty. Famous for: numerous cheap bars, restaurants and shops and one of the best areas for nightlife. Some modern art galleries, such as Pastificio Cerere. Home to the main university campus. San Lorenzo is the neighbourhood immediately east of Termini train station. Developed in the late 1880s, San Lorenzo was predominantly a train workers neighbourhood and maintained a not-so-pleasant notoriety through the mid-1900s. In July 1943, Allied forces bombed San Lorenzo, which led to a redevelopment of the area in the 1950s. In the late 20th century, San Lorenzo became a mecca for artists, due to its lower rents, as well as galleries. San Lorenzo is proud home to La Sapienza, one of Italys oldest universities, which gives the neighbourhood its present vibe as both student and hipster. San Lorenzo is the traditional student area immediately east of Esquilinos Termini Station train tracks. Via Regina Elena and Via del Verano are its eastern border, while Viale Pretoriano and Via di Porta Labicana are its western border. 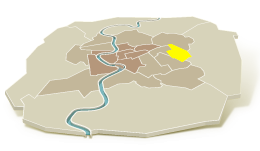 Circonvallazione Tiburtina frames its southern end, whereas the Policlinico hospital marks the end of the northern area of San Lorenzo. The areas main landmarks include La Sapienza, Italys largest and one of its oldest universities and Basilica of San Lorenzo Fuori delle Mura. The basilica is located at the neighbourhoods eastern border and is gateway to Verrano Cemetery, also known as Campo Verrano. The ancient 3rd-century AD wall runs along San Lorenzos western border and is an excellence logistical reference. Via Tiburtina cuts through the area from west to east, almost dividing the neighbourhood in half. Esquilino (west), Castro Pretorio (northwest), North and East frame the San Lorenzo neighbourhood. Whereas Esquilino is the hub for Romes central train station Termini, counterpart Castro Pretorio is a centre for short-term lodging. The large East and North areas are more generic suburbs. Much like neighbourhoods Castro Pretorio and Appia Nuova, San Lorenzo is filled with local-owned shops, businesses, restaurants, cafés and clubs. It is the university district, so its atmosphere is friendly and informal - this is a great asset in getting to know your neighbours. You will find ongoing conversations at any hour of the day and night, so just jump in with a Roman Che sta a fa (whats going on), and see where it takes you. There are several local shops to suit all needs (groceries, gifts, clothing, home wares) throughout the entire San Lorenzo area. The best directional indication would be to focus on the streets south of Via Tiburtina. For the determined one-stop shopper, head to nearby Termini Station. It has a vast selection of shops (and restaurants) in its ground and underground levels. Shops include well-known names such as department store UPIM, Bore bookstore, Benetton, Calzedonia and Nike. San Lorenzo has quite efficient connections to all areas of Rome via tram, bus and even metro. Its proximity to Termini station also facilitates these connections. Useful bus lines include: 71, 163, 492 and 495, which connect the area to Prati, Centre, Appia Nuova, and Termini and Tiburtina stations. Trams 3 and 19 run through the neighbourhood and connect to Vaticano, Villa Borghese, Coliseum, Testaccio and Trastevere. The nearest metro stop is Castro Pretorio, metro Line B (Blue), in neighbouring Castro Pretorio. Line B has stops at Termini and Tiburtina stations, Cavour (Monti), Colosseo, Aventine and Piramide (Ostiense). Line B also intersects Line A at Termini, making swift connections to Piazza di Spagna and Vatican. San Lorenzo has an engaging social and cultural scene, due in part to its history as a student district. La Sapienza has the largest student body in Europe with over 100,000 enrolled students coming from Rome, Italy and other European countries. This multi-cultural student population has created a vibrant daytime and evening atmosphere and encouraged a recent rise in cultural events. Not to be missed is the Mura Aureliane, the ancient 3rd-century walls that run along the western border of the area. Throughout the centuries, Romans have inhabited the walls here, making unique and interesting architectural feats in the walls. In fact, in the bottom corner bordering Esquilino is Porta Maggiore, with its monument to aqueducts. Another ancient monument worthy of a photo is Sepolcro at Largo Talamo - a tiny rectangular mausoleum with small dome. On the eastern edge of San Lorenzo is The Basilica San Lorenzo fuori delle Mura, one of Romes four most important head churches and entrance to the large cemetery Verrano. A walk through Verrano is always interesting as there are several beautiful Victorian-era tombs and mausoleums of note. San Lorenzos background as a train workers neighbourhood and student district means that the neighbourhood has only recently developed as a trendy place whose two preferred hangouts are Pastificio Cerere (an artist exhibition space) and SAID chocolate factory. San Lorenzo has many great places for dining out. Some of the areas best eateries include Tram Tram (a trattoria), Pinsa e Buoi (focusing on meats), Formula 1 (pizzeria) and SAID - the chocolate factory with excellent hot chocolate, of course. Pastificcio Cerere has recently opened a restaurant within its artsy complex. In general, the entire area has a great selection of food stands, cafés, restaurants and bars. As a student hub, San Lorenzo has a name as a good place to go in the evenings. It has a wide variety of bars, clubs and discos to suit all tastes. Your best bet is to head to Piazza dellImmacolata. Its surrounding streets are practically lined with bars and pubs, known as locali. You could probably stay within a 200-metre radius the entire evening and never run out of things to do. Felt and San Lorenzo Caffe are faithful neighbourhood haunts. For full information on our approach to users comments on our site, please see our publishing policy. Please feel free to contact us by phone or email if you have any questions about it. On various pages throughout this site we invite you to leave comments and ask questions about places and subjects of interest and on the accommodation that we provide. We believe that your opinion is always worth hearing and your ability to share insights, stories, tips and suggestions through our comments function is an important part of the online service that we offer. We will always provide a response to any comment that requires one  so feel free to ask questions or raise issues. They contain swear words or insults. They advertise a business or service (we are however happy to consider covering services provided in Rome on our blog). They are off-topic or have been left for malicious reasons by an anonymous source (spam). In short our policy is to publish comments unless they are at risk of damaging the quality of our website or are likely to result in legal or technical difficulties. Transparency will always be one of our most important values and we go to great efforts to ensure your feedback remains at the heart of what we do  so please don´t hesitate to get in touch!